Few people would dream of asking for “chicken—medium rare, please” at their next neighborhood barbecue, but at a few (emphasis on few) restaurants around the world, that’s exactly what diners are ordering. 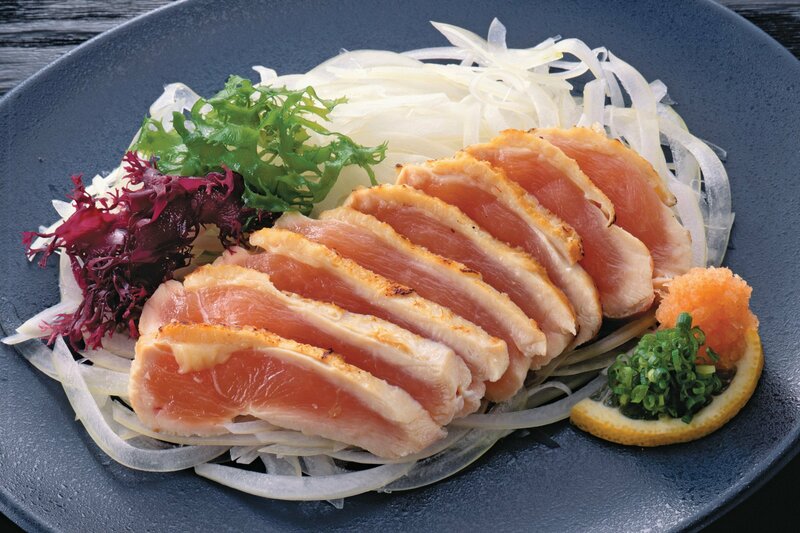 Whether billed as chicken sashimi or sasami, chicken tartare or tataki, select restaurants are daring to serve meat so raw it’s practically still clucking. After a few friends raved about their own electrifying experiences with the dish, I decided to find out what the fuss was about—and whether I could get my hands on this elusive culinary contraband. The most popular restaurant for raw chicken on the West Coast is the always busy Ippuku in Berkeley, California, whose most “OMG, guess what I just ate!” dish is chicken tartare served with a raw quail’s egg. “Freshness is really the key,” says founder and chef Christian Geiderman. “Our chickens come in with the heads and feet on, and the rigor mortis is still so fresh in them that you can stand the chickens up by their legs.” By using poultry from a few small farms, the kitchen knows exactly how long ago each bird was killed. A quick bath in boiling water for five to 10 seconds, just long enough for the outside to turn white, is the only means of cooking it at Ippuku. Geiderman compares the mouthfeel to raw tuna and the flavor to yellowfin or bigeye. Ippuku was partly inspired by Nagomi, a Tokyo restaurant run by Geiderman’s friends and one of many known for serving poultry sashimi. “In big cities like Osaka, Kyoto, and Tokyo, it’s just run-of-the-mill,” says Geiderman. “Almost any upscale yakitori place will also have chicken sashimi on the menu.” (Yakitori means grilled chicken, but it’s more known as a style of cooking meat on skewers over hot coals.) Even Anthony Bourdain chowed down on the stuff at Tokyo restaurant Toriki while cameras rolled for his TV show No Reservations a couple of years ago. These cubes are so raw, they glisten. So what of the insidious S word: salmonella? As Geiderman points out, all chicken has a risk factor for salmonella, but the inner breast—the part getting its tartare on at Ippuku—is the most well protected, decreasing its chance of exposure to salmonella, which lives in the digestive tract. Working with a small farm is key. At large commercial chicken operations—the ones likely supplying your local grocery chain—chickens pass through many more hands, upping the risk for salmonella (incidences increase in the summer, when warm weather provides cozy conditions for bacteria, according to the New York Health Department). Technically, curious cooks could try a similar version at home, but unless they’re looking to get better acquainted with their toilet bowls, it’s not advisable. Steak tartare, on the other hand, is commonly accepted; after all, it’s just a few degrees cooler than meat cooked medium rare. Better to leave it to the chefs to push culinary boundaries, transforming something slightly terrifying into an edible work of art. At Dos Palillos, a Michelin-starred Spanish-Asian tapas bar with locations in Barcelona and Berlin, chef Albert Raurich serves chicken sasami, sourced from a free-range farm where the birds eat grains and corn. Made by marinating the tenderloin in ginger oil and grilling it about a foot above a flame for two minutes max before finishing with a ginger-infused soy sauce and a bit of sansho pepper and wasabi, the result is served raw, but hot. “Very mellow and sweet, and a bit fatty,” says Raurich, who admits that some diners arrive eager to try anything, while others are convinced only after hearing about the sensations they’ll feel on their palates. For some especially reluctant customers, the restaurant reveals the dish as chicken only after they’ve eaten it. But with Raurich’s pedigree as the former head chef of Michelin-starred El Bulli, widely recognized as the best restaurant in the world, who wouldn’t trust him? With yakitori gaining popularity in the U.S., I thought certainly one or two places in New York City could help me on my quest for sasami enlightenment. After opening in 2004, Yakitori Totto was infamous for its chicken sashimi, although The New Yorker’s Leo Carey deemed it “less dramatically weird than one secretly hoped.” Despite my pleas, Totto says it stopped serving it six years ago. Yakitori Torishin, the city’s only Michelin-starred yakitori joint, is its closest competitor. After reading numerous Yelp reviews claiming that Torishin serves sashimi (and one waitress’s confirmation), I ate my way through the delicious omakase menu of chef’s favorites—past chicken hearts, thighs, and oysters (a small piece of dark meat within skipping distance of the thigh), grilled shishito peppers and corn, and duck breast and asparagus, among other skewered delights, all the way to dessert. Wait ... no sashimi? Despite the arrival of chickens every day from a farm in Pennsylvania—“very fresh,” says the waitress, making a chopping motion with her hands—they stopped serving chicken medium rare about a year ago (although one Yelp reviewer claimed to have tried it six months ago). Blame the city’s health department, which demands poultry be cooked to 165 degrees—and, perhaps, the increased publicity that arrives in tandem with Michelin accolades. She asks one of the chefs where I might be able to find this elusive dish and translates his advice—that I have it with his master chef at Toriyoshi. In Tokyo. And there’s always the more permissive Berkeley. Meanwhile, the waitress points out that one of my skewers, long since eaten, was similar to sasami. The juicy breast tenderloin topped with a smudge of wasabi was cooked less than the others, probably medium. I had come so close to greatness, but all I could remember was that it tasted like chicken.